Leave it to a 14-year-old junior rider to set some new endurance riding standards in one of the country's oldest and most prestigious 100-mile rides. Not only was the 40th anniversary of the Old Dominion 100 Bryna Stevenson's first endurance ride by herself, but she also set the record aboard Whisperstreams Atropine (Maddy) as the youngest winner; she and Maddy won the Best Condition award; and she and Maddy won the Old Dominion trophy (day-after Best Condition)* the next morning. While the trail through Virginia's Shenandoah Valley and the Blue Ridge mountains is known as "The Beast of the East," for its "rocks, heat, rocks, humidity, and rocks," according to 4-time finisher Dawn Hilliard, and is "wicked tough," according to Daryl Downs, previous youngest winner of the 100-mile ride in 2005 at age 18, it was Bryna's and Maddy's kind of trail. "Maddy really likes hilly trails and she does really well with them," Bryna said. Owned by Jen Stevenson, Bryna's mom, it was only the second time Bryna and Maddy had partnered up in an endurance ride. Their first and only ride together was in November of 2010 in the 30-mile Mustang Memorial, Maddy's first endurance ride. Since then, Bryna has accumulated over 2500 endurance miles throughout her junior career. The now-10-year-old mare had been languishing in a Western Pleasure barn before the Stevensons got her. "That was not working out for her; she would take off with the owner, and bolt," said Jen. "We observed her out in this field for about 6 months, and I thought, 'Wow, she's really nice.' The barn closed in the summer and they were dispersing all their horses, and a friend of mine said they had this Arab that they couldn't get rid of that I should go take a look at." It turned out to be that same mare, and they wanted $550 for her. "Bryn tried her first and said to get her, and I went the next day and tried her myself, and she was a lunatic, but… we bought her." Dubbed "Whisperstreams Atropine," or Maddy for short, (Whisperstream is the Stevenson barn name), Maddy didn't come with papers, but is rumored to be 3/4 Arabian and 1/4 American Saddlebred. Jen took up with Maddy in endurance after Bryna started her, riding her to 33 of 35 completions and 1690 miles over the next 4 seasons. One can easily deduce the mare much preferred the endurance trails to a life of Western Pleasure. Maddy already had 2 100-mile completions to her name, and Bryna had 3, and both had ridden over the 50-mile Old Dominion course, though neither had ever tried the Old Dominion 100. After Jen and Maddy finished the 50 at Old Dominion last year, Jen and friend Lisa Delp got to talking about how Bryn could probably do a nice job with Maddy at this year's OD 100. "From that point on, we really wanted to have Maddy prepared aptly for this hard ride." Bryna hadn't started out the ride thinking she'd win, however; she had just wanted a completion. "I started my ride and I got probably 2 miles down the trail, and Maddy kept going. She kept catching up with the leaders, and I just rode her on a loose rein all day, and that's just where she stayed, up front. She felt really good." Bryna rode the first 3 loops with Virginia riders Tom and Gina Hagis, experienced OD riders. Gina complimented Bryna afterwards, "She is a excellent rider, nice and soft. She is easy to ride with, quiet, and can put her horse in the back or pick a good pace in front." The fourth vet check was where the ride turned solo for Bryna and Maddy. "We came into 'Big 92' [at 57 miles]," Bryna recalled, "and Maddy vetted in all A's. There was a hill leaving Big 92, and Maddy stopped while going up the hill, turned around and saw them coming up the hill behind us, and she just took off, as fast as she could. I didn't ask her to do anything the entire loop. The rest of the ride I was all alone." Bryna had ridden Maddy on training rides before, and she'd ridden in the dark before, but she had never ridden Maddy in the dark before, so she after the sun went down, she took it easy. "I asked her to walk a lot because I wasn't sure what she would do." Maddy can be a spooky horse, but "the last loop went really well." Jen Stevenson had started in the day's OD Limited Distance ride, but pulled Rider Option when her horse threw a couple of shoes. She spent the rest of the day waiting for news on her daughter, since all vet checks are out of camp. She was waiting at the finish line, overwhelmed as the glowsticks from Maddy's breastcollar showed up on the road nearing the finish line. "I was trying to fight back the tears of happiness," Jen said. "I was just so proud of my daughter and my little horse." Bryna was very tired, but elated. "I was a little out of it. I'd just had a cup of coffee at the last hold but it hadn't totally kicked in yet. I remember when I was coming across the finish line everyone was patting me on the back, it felt really amazing." Bryna is quick to credit the Hagises for their help during the ride, and both Bryna and Jen praise fellow Northeast endurance mother-daughter duo Lisa and Meghan Delp with the help they've given the Stevensons over the years. "They've been our mentors over the past 2 years and they've really contributed to our being able to finish rides. We had some trouble in the beginning, and they really selflessly offered us so much guidance. They sponsored Bryna on so many rides when I got pulled, and they really taught us how to complete a ride with the horse looking good," Jen said. "And my husband Paul is a huge part of this," she added. "He was Bryn's crew and also drives us to every single endurance ride we go to, and every horse event - when we're not endurance riding, we're usually going to an event or a show or a pony race." Bryna first climbed on a horse when she was 4 years old, riding English and doing some lead line showing. By the time she was 4 1/2, she was walk/trot/cantering and jumping cross rails on a really placid registered Quarter horse. She has done barrel racing, gymkhana, hunters and jumpers, and CTRs. Last year she started eventing. "I just want to be clear: Bryn usually chaperones ME at rides," Jen laughed, "because she's a much better rider than I'll ever be. " 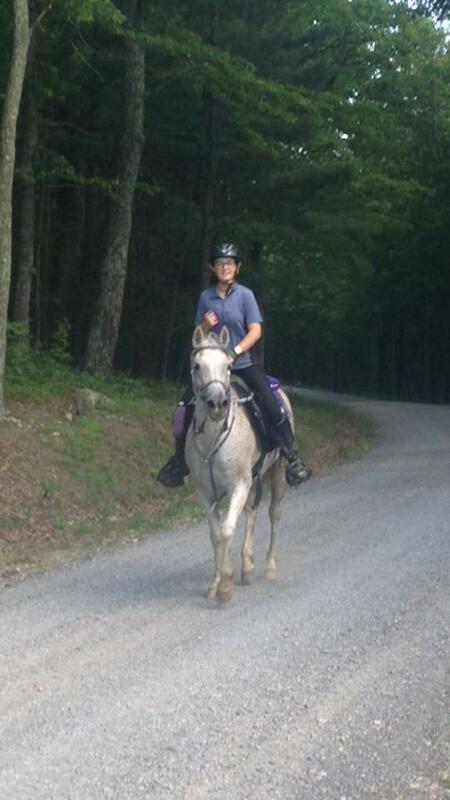 With her experienced and varied riding background, Bryna is striving to share this wonderful sport of endurance riding with other potential junior riders. Regina Welsh is a friend who got Bryn into steeplechasing, and she's also the founder of US Pony Racing, developed for "for the purpose of developing and promoting racing opportunities for young riders." Bryn thought that endurance rides would be good conditioning for the steeplechase horses who are expected to go long distances, and for the young riders. She created a video to help get more eventers and steeplechasers interested and involved in endurance. Jen added, "It would be a great opportunity to get kids out of the riding ring. A lot of kids in New Jersey just ride in arenas, and they really don't have the opportunity to go out on the trails because they've never been exposed to it." Despite this huge accomplishment of winning one of the toughest endurance rides in the country as a Junior rider, Bryna took the whole adventure in stride throughout the ride weekend. Veteran endurance rider Angie McGhee, who finished the OD 100 for the first time in the middle of the pack, said, "I'll admit, I have been leery of some of the teens with minimal endurance background that have been jumping in with both feet, full speed in our international scene. [Bryna] was NOTHING like that. Very sweet, unassuming, grateful, and knew her own horse very well and gave it a super ride. One of those people you could feel happy for and good about the sport." Daryl Downs added, "If my record of youngest winner of the OD was taken by anyone - I would want it to be Bryna. She is very talented and we share a lot of good times!" Fortunately for endurance riding, Bryna Stevenson has many miles of trail ahead of her as junior and senior rider, many more goals to accomplish and share, and many more records to set. Bryna's video "A Year's Progress"
*The Old Dominion Trophy is the premier 100 mile division award presenting the to the horse/rider team which has demonstrated optimum performance based on its post-ride recovery and condition at the Old Dominion 25/50/100 mile ride. The formula for determining a winner is based on a veterinary score, total elapsed time and weight carried. Equine leg protective devices are prohibited during the ride. Horses are judged the morning following the close of the 100 mile ride.